Little Jimmy Dickens told the same joke he’s been telling for about 50 years (he’s 91). Of course, just because he’s been telling it for fifty years doesn’t even mean it’s original. This joke could go back to the middle ages for all I know. And even though the Grand Ole Opry is not exactly on my regular playlist, I have heard Little Jimmy tell this joke a dozen times. But I laugh every time. Because there is an elemental truth to this joke. Life is full of exasperating ironies. As a little girl, it didn’t take me long to recognize the unfair, maddening paradoxes of Life. Mom and Dad certainly helped. But I found out pretty quick that it isn’t quite absolutely anything. Stay up past my bedtime. Have a Hershey bar for breakfast. Wear makeup to third grade. Ride my bike in the street. Tell my little brother that there was no Santa Claus. And about a zillion other things. But besides that zillion… oh yeah, absolutely anything. Ha! (and I know you are all laughing your asses off too). The Work/Life Balance means that you can succeed at Work as long as you have no Life. In my new passion to get healthy, I added a couple of Zumba classes to my Yoga practice. 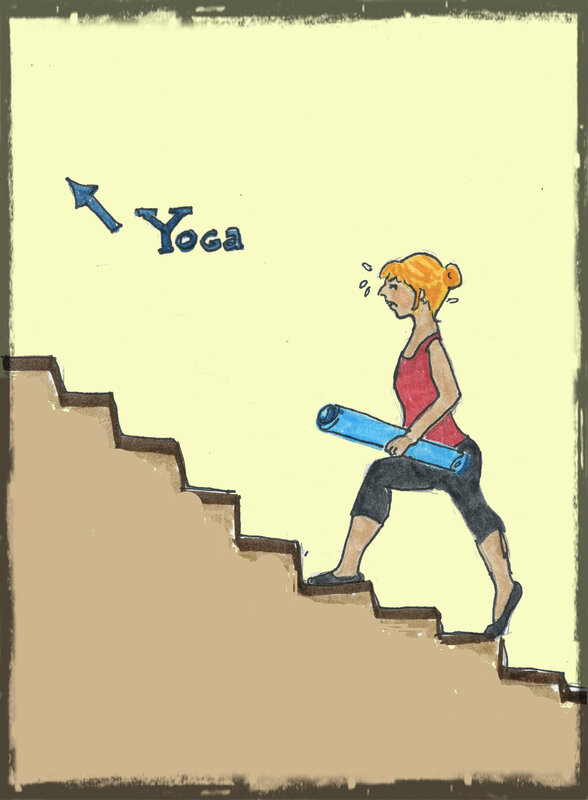 I attend Yoga classes in a beautiful old studio… up three LONG steep flights of stairs. Some days just getting to the top of the steps is challenge enough. And then there’s Zumba. The gym I joined has the slantiest parking lot in town. I don’t need to do any biceps curls. Opening the car door is an uphill workout. Do I really have to exercise before I exercise? And now I see that Life’s Stupid Paradox has even more in store for me. My mother is eighty-eight. It’s a good thing she has all day to get her errands done. Because the wonderfully amazing huge supermarkets allow you to buy ANYTHING you want, any time you want. How convenient. But there’s a hitch. (of course). My mother can’t buy bread and milk on the same day. Because the bread is at one end of the store. The milk is at the other. And she can’t walk that far. she needs to jump in one of those motorized carts and terrorize everyone while speeding through the aisles! My mother won’t even use a cane. Never mind a scooter. I’m sure I will be just like her – because I am already just like her. I’m very impressed with the Zumba, too, having recently watched a tape. It does look like fun…absolutely nothing I could ever do from a tape at home, but I bet a class would be fun. My workout place also involves a three-story trek. Must be a conspiracy. It’s because fitness instructors are so goddamn fit. One of the sometimes pleasant, sometimes not pleasant features of the NYC metro area is that we don’t have those aircraft hangar sized supermakets because there is NO SPACE. Even our new HMart, which is really big, is dwarfed by the behemoths I see when I visit Lexington or anywhere else in the Midwest. Yeah, my Mom was like that too. She liked to cruise the mall (just like the kids) but would tire out too fast. The wheelchairs and other devices they had were just too “uncool” for her to use. Sometimes I would go get the car and pick her up at nearest entrance to where she petered out. Kudos to you for your exercise routine. I’m afraid I would have bagged it if there were more than 2 steps. I hate to start my exercise all sweaty! You summed up the work/life balance paradox perfectly! How about a RazR scooter for your mother????? My mother came from a poor family. I’m not sure she ever had a bike or learned to ride. So her balancing skiils are a mystery to me. But a RazR would be cool. She’d be the coolest grannie on the block! So true. I bring my gym bag to work every day, so that if I hit a motivational slump, I can take a break to go walking or to the gym that we have on campus. But I have to leave the bag in my car because it’s too heavy to carry along with my already overloaded briefcase. So you know what prevents me from ever exercising at work, right? The walk down three flights of stairs, out to my car to get the bag, and then back up all those stairs (or across campus to the gym). I mean, if I can’t face that walk, how am I supposed to work out? Life IS unfair. That’s why I always encourage runners and walkers to use the track at the high school…. so that when you tire out you’re never too far from where you started. A dear friend recently joked that by the time she wrestles herself into her sports bra, she doesn’t have the energy left to go to the gym. The Stupid Paradox is universal. My mother refused to use a walker but resorted to a footed cane after she broke her pelvis. She recovered and lived a few more years–to age 92! I don’t go to my nearest grocery store because it has that city block divide between milk and bread. It was near my gym and I used to wonder why I’d bothered going to the gym. Now I go to a different gym and a regular-size grocery store. another paradox – getting into shape after baby. ha! after baby it took me about three years to have the energy to be able to THINK about working out. I think I would be saying, “Well, I just had a baby” as an excuse until at least he went off to college. You so impress me, you so make me laugh. I so need both! You are a breath of fresh air this morning …. thank you. You never seem to disappoint and always worth the trip over here to check it out. Of course, walking from the parking lot to the store sometimes requires a rest period. I sometimes find myself driving around the parking lot at the Y looking for a close-in parking spot. Then it occurs to me that kind of defeats the purpose. There are a couple of small, locally-owned grocery stores in town that survive against the massive Wal-Mart places only because they are the perfect size for the old people to get around in. It’s amazing how we look for a parking space close to the gym…. And I also like small supermarkets – I can survive quite well without 87 different brands of cereal. What a HOWL. It ticks me off to have to walk to the nether regions of a grocery store to pick up milk and then bread in the opposite direction. Do the powers that be figure only young people need to eat? Good for you: zumba AND yoga. Looking g-o-o-d! 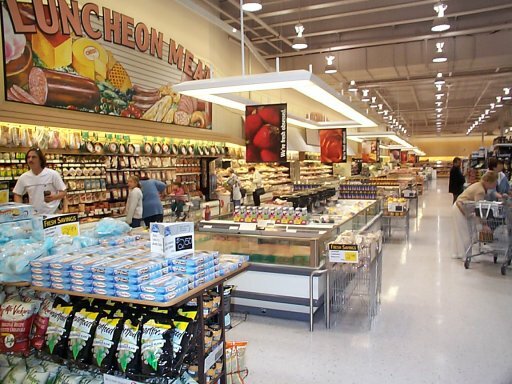 And if I have to just run in for one thing… I really have to run, or it takes 15 minutes to get to the correct aisle. One of these days I am going to use my “Runtracker” and find out exactly what the distance is between the milk and the bread in one of those stores. It has to be at least a 1/2 marathon. Not sure where you live, but what really gets me riled is a store laid out like Stew Leonards… they have a maze set-up so you have to go through every aisle to check out. Once was enough…. I won’t shop there anymore. I am in Toronto area. That sounds like the Ikea stores here. There are actual arrows you have to follow that lead you through everything and then to the way out. If you don’t follow the arrows you are lost. Enjoyed the post. Have to say though, I use the scooters at the mega stores. (long story, bad heart, bad bones) It is the MOST frustrating thing to use one though. People don’t often look down to see the scooter. They walk right in front of me, and little kids run right in front of me, good thing they have an autostop if I let go of the power – otherwise some of those kids would be toast. However, without the scooter, I couldn’t shop on my own at all! I am working on being like the cartoon character, Maxine. My husband used to take our disabled neighbor to the market. A large supermarket was okay, but our small local market and our drugstore were disasters… the aisles were too narrow. They always ended up having to call for “Cleanup in Aisle 3”. I’ve decided the only way to have work/life balance is to succeed at life by not going to work! Great post.